EaseUS has a Photo Recovery Software that you can use to recover lost, formatted and deleted digital photos, music files or any video that you have accidently deleted from a removable media. Many a times you could end up by corrupting the data stored on the removal media by mis-handling or improper uses. At those situations this data recovery software shows its great capability and helps you in recovering the lost data. EaseUS Photo Recovery application works with almost any type of digital and multi-card reader or it could be used to recover photos from any other storage media in the form of drive letters on your laptop or PC. This photo recovery program displays all the images and other files that it scans and after that you can recover them to your desired place. EaseUS Photo Recovery software comes handy and helpful in the below mentioned situations. Ease US Photo Recovery Provides Image Recovery even after corruption of images files due to improper handling or pulling out the card while it’s still in use. It can retrieve the lost photographs due to any fatal error. It can recover the Photos that have been corrupted because you have switched of the camera during a write process. It has the capability to recover Digital Media after improper Formatting of any digital storage media or any other storage device that you are using. This Image Recovery utility software recovers all the data that has been lost due to the presence of any viruses or malwares. Don’t worry if you have deleted your important photos from your friends bday or any other important event, as by using this great utility tool, you can recover them all on a click. You can recover the deleted images from the enlisted memory media. Memory Sticks, Flash Cards, Sony Memory Stick, IBM Micro Drive, SD Cards, MMC Cards, XD Cards, Secure Digital Card, Hard Disks, Mini Disks, Zip Disks, and portable hard drives. We have tried to enlist all the storage Medias from which you can recover the photos by the use of this software, so please pardon us if we have left something by mistake. 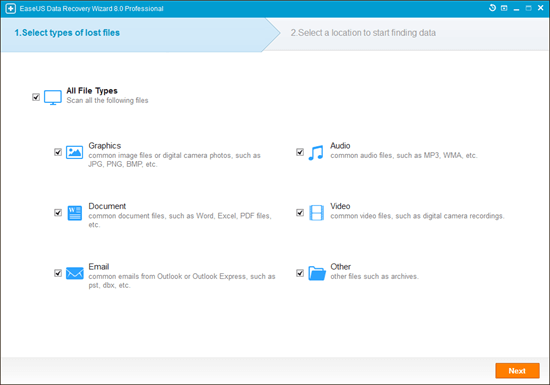 We are going to put up the step by step guide on how to retrieve deleted files using EaseUS data recovery software. Step1. Launch he software and click on graphics, then hit next to start the image retrieval process. Step2. Select the media from which you wish to recover the data. Step3. Once the scan has been finished, you can view preview the files, you just have to click recover in order to restore the deleted files. Step4. Voila, you are done. Enjoy now. You will find a lot of softwares that claim to be the best in image recovery, but trust us; you won’t find anything thing better than this because it offers up to 2GB of recovery for free.